Learn more about how Older Adult Services can help improve quality of life. Andrea* walked arm-in-arm with Yelena Mushkatina down the hallway toward the laundry room of her new senior housing. Andrea has washed clothes hundreds of times since her eyesight began to deteriorate in 2003. She is now legally blind. But having someone to help her count the steps to nearby amenities and familiarize herself with surroundings in a new home was just what Andrea needed on the path to improving her overall well-being, health and stability. Yelena, a JFS Geriatric Care Manager, connected with Andrea through a string of referrals last year. At the time, Andrea had hit a difficult point in her life. Worsening eyesight, the loss of the stepfather who helped raise her and rising rent coalesced into an overwhelming situation. JFS helped her find a more affordable place, a difficult task, even for organizations like JFS. While volunteers and her caseworker Yelena helped Andrea settle into her new home, JFS also helped ease some of the financial burden of relocating. A JFS volunteer now stops by about once a week. Andrea’s Friendly Visitor is about her same age, and in addition to companionship, Andrea’s visitor helps by reading her mail to her and other tasks around the home. It has been a learning lesson for all, including Yelena. “Andrea taught me a lot,” Yelena said. A large part of that learning was understanding how to balance assistance and autonomy. As a care manager, Yelena provided assistance, but with Andrea, she also honed her skills as a partner, developing a greater understanding of when to be an advocate for her client and when to be a partner with her. Andrea wanted help with her transition and daily chores but not someone to just do it all for her. 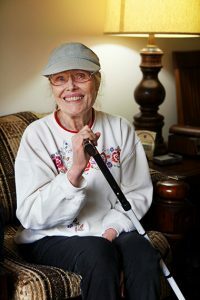 Because Andrea’s vision loss came later in life, she’s had to adjust while also managing the changes of aging. Her sight issues started in her 50s, impacting her health and well-being. “I liked my life. Then, all of a sudden, my life as I knew it was gone,” Andrea said. Although Andrea has worked to adjust to her major life changes, JFS was able to help as difficult situations compounded. Because Andrea knows it is a transition from sighted to blindness, emotionally and physically, she wants to help others in situations like hers. “What I want to do is be a resource and be a mentor for those going through that,” she said.